The Bay of Pigs Invasion (La Batalla de Girón) was an unsuccessful military invasion of our mystery country by a CIA backed paramilitary group in April 1961. On April 15, B-26 bombers attacked air fields and on April 16, 1,400 troops, including infantry and paratroopers, landed at Playa Girón in the Bay of Pigs. A local militia was initially overwhelmed, before Prime Minister Fidel Castro took control of the counter-offensive operation. On April 20, the invaders surrendered. Can you name that county? 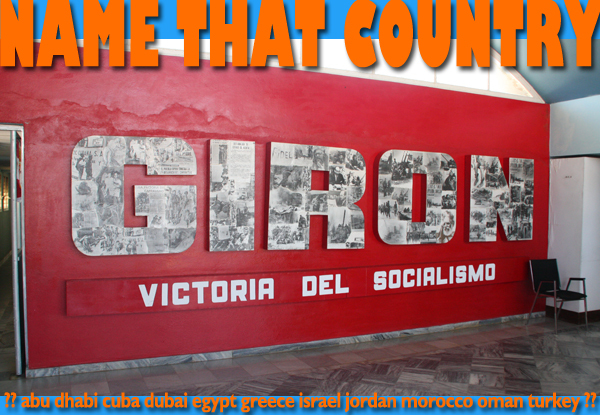 This entry was posted in Cuba, name that country quiz by yalla2013. Bookmark the permalink.